President Donald Trump is the first U.S. president in several decades to not visit the monument honoring the heroes of the Warsaw Ghetto Uprising. During his one-day trip to Poland, President Donald Trump met with the country's president, attended a summit with the leaders of 12 other countries and spoke to the Polish people. But one thing he didn't do before heading to Germany for the G-20 summit has drawn criticism. Trump didn't visit the Monument to the Ghetto Heroes in Warsaw. 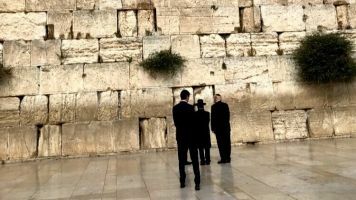 Leaders of the Polish Jewish community called it a "slight," since every U.S. president who has visited the city since the fall of communism has stopped at the monument. Their statement said the presidential visits "meant recognition, solidarity and hope" following the decimation of Poland's Jewish population during the Holocaust and the community's efforts to rebuild after the fall of communism. The monument commemorates the 1943 Warsaw Ghetto Uprising, a nearly monthlong revolt by Jews who still remained in the ghetto. Their goal was to avoid the fate of hundreds of thousands of other Jews in the ghetto who were sent to concentration camps or killing centers, or killed on the spot. While Nazi forces eventually put an end to the resistance, the United States Holocaust Memorial Museum calls the Warsaw Ghetto Uprising the "largest, symbolically most important Jewish uprising." It inspired other uprisings during the Holocaust. Trump's address to the Polish people took place at the Warsaw Uprising Monument. The 1944 citywide uprising aimed to reclaim the city from Nazi forces before the Soviet army could occupy it and subject it to communism. The efforts failed. Trump did mention the Warsaw Ghetto and the Warsaw Ghetto Uprising by name in his speech to the Polish people. "A vibrant Jewish population — the largest in Europe — was reduced to almost nothing after the Nazis systematically murdered millions of Poland's Jewish citizens, along with countless others, during that brutal occupation," Trump said. First daughter Ivanka Trump ended up visiting the Monument to the Ghetto Heroes and the POLIN Museum of the History of Polish Jews on Thursday.